Let's start from the last page, from the author's note which lays the footwork and history behind this poignant story. My Name Was Hussein is based on Hristo Kyuchukov's real life events. It is about the way of life in a Roma family and is told in the voice of Hussein, a 10 year old, who lives with his parents in Bulgaria. Hussein belongs to the Roma people. Romas were originally nomads, who migrated from India and settled in Eastern Europe. Their culture is a mix of Indian-Persian-European, and they speak the Romani language. Hussein is a Muslim Roma. He loves his name, is proud of his heritage and enjoys celebrating Islamic festivals, during which his family prepares elaborate feasts, buys new clothes and reunites with grandparents. Hussein's family is rich in love, happiness and celebration. Unfortunately, all that changes with the communist invasion, when the government decrees that only ethnic Bulgarians be part of the country. People like Hussein are left without an identity and his family is shut in his own home, without the liberty to worship, visit family or celebrate any festival. They are threatened at gun point to change their identities to Christian names. Selim, Sanie, Hassan, Hussein are no longer acceptable. Left with no choice, Hussein becomes Harry to the outside world, but who he is remains unchanged and his 'special name' within the family remains untarnished. My Name Was Hussein is one of those books where the text remains exceedingly simple, while the illustration picks up the poignancy and throws it across the wall in large font. The initial pages start off with neutral and earth tones contrasted against a splash of pastel or bright orange or pink, to indicate joy even in a meager economic situation. But as the story progresses, the darker shades of gray and black predominate. Hussein's soulful, dark eyes on the cover give away the quality of the sketches. The feeling of contentment in the family is conveyed with a smile hovering at the corner of lips, while in the latter half, with just a stroke of the pencil, those very same faces express sorrow, despair, fear. There is one page where the family debates their choices, or lack thereof, and we see their backs walking down a bleak road. This picture says all that is unsaid of the family's dilemma. 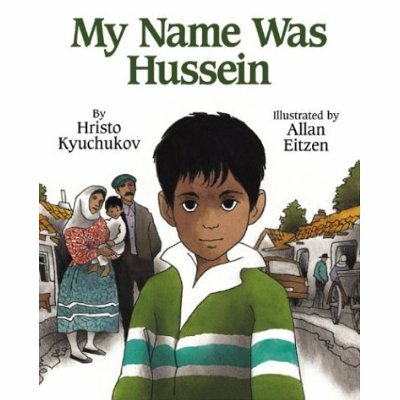 I highly recommend My Name Was Hussein for kids who have more established concepts of history, religion and identity. The cover is so eye catching. Sounds like a great book. Will look out for it. KM, nice review and thanks for bringing this out. Sounds like a sensitive subject is being handled beautifully here. Loved the way you have written about the illustrations. What a wonderful review, Kodi's mom! Makes me want to read the book now. You have brought the initial contentment and the following bleakness to us very well. KM, this is very neatly done review of a sensitive subject book...you have conveyed the essence of the book beautifully ! Oh. My God. I have goose pimples reading this KM. Only you could have written about a book like this. You writing is also deliberately simple, while the emotions wash over us in a big large font. I can't wait to read this for me. Maybe even see if Winkie would like to. Very neat review K's mom. I would definitely read it for myself. WRT the kid, I will wait for her to show signs of readiness. You've captured the essence of this book so well, KM. Loved your review. Neatly reviewed KM, as always:) Loved the way you recommended the audience for this book in the concluding lines. I will keep this book in mind. Thanks. This book is just the right introduction to a sensitive history topic with kids. You'll also be pleased to know that the author now holds PhDs, three of them, and a specialist in Romani linguistics. I found that bit of his biography to be very inspiring. wow KM, the review took my breath away. i dont know what the book will do.